When two bombs exploded near the finish line of the Boston Marathon, the courageous people of Boston jumped in to aid those who were hurt. Others found a way to help by donating blood, offering a place for the marathon runners to stay overnight, or simply providing food during a time of need. NBC's Anne Thompson reports. Even one of Boston's big beloved "Pats," New England Patriots' retired offensive guard Joe Andruzzi, was captured on camera carrying a woman to safety after the explosions. “While I appreciate the interest in hearing our perspective on today's horrific events, the spotlight should remain firmly on the countless individuals -- first responders, medics, EMTs, runners who crossed the finish line and kept on running straight to give blood, and the countless civilians who did whatever they could to save lives. They were the true heroes. Our thoughts and prayers go out to all those affected by this senseless tragedy,” he said. An active-duty service member, he was at the finish line as the bombs exploded Monday. He was photographed wrapping the red shirt he wore during the Boston Marathon around the bloody leg of a man at the blast site. He does not want to be recognized. He wants only prayers for the victims. “That’s him: ‘This is not about me. Focus on what’s important.’ That’s just who he is,” said Larry Olson, spokesman for Team Red, White & Blue, a veterans advocacy group who had 17 participants in the marathon, including the man who offered his shirt to stop the man’s bleeding. Finish-line coordinator Tom Meagher was the first to reach a fallen runner after the initial blast. "I turned and saw a huge wave of smoke and glass coming at me, and I actually saw bodies flying, moving around, uncontrollable," Meagher told Matt Lauer on TODAY on Tuesday. Dr. George Velmahos, of Massachusetts General Hospital, says he is proud of his team's response in the wake of the Boston Marathon blasts, highlighting one physician who ran the marathon and then headed right to the emergency room to treat victims. He helped many, including a man who lost both his legs below the knees. Panter also praised other bystanders who immediately jumped to action. Panter wasn’t the only doctor who happened to be on hand. Marathon runner Chris Rupe, a surgeon at the Mowery Clinic in Salina, Kan., crossed the finish line about 30 seconds before the first blast. He told Runner’s World he headed toward the injured, thinking there was some sort of structural damage. The marathon is also a big draw for organizations there to raise funds for noble causes. Carlos Arredondo, a Costa Rican native who had been at the race to support a group running for fallen veterans, also jumped in to help. He can be seen in numerous pictures, wearing a cowboy hat, helping evacuate the injured. One of Arredondo’s sons, Marine Lance Cpl. Alexander S. Arredondo, died in battle in Najaf, Iraq in 2004. In 2011, Arredondo's other son, Brian, 24, took his own life. In one image from Monday, Arredondo is helping move a man in a wheelchair and appears to be pinching closed a severed artery protruding from the victim’s thigh, stanching the flow of blood from a torn and shattered leg. "I kept talking to him. I kept saying, 'Stay with me, stay with me,'" Arredondo told the Portland Press Herald of Maine. Dr. Allan Panter was waiting for his wife Theresa to cross the finish line at the Boston Marathon when the explosions occurred. 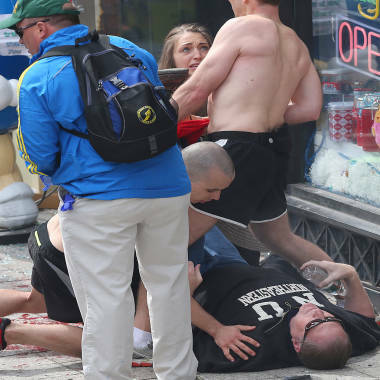 As he tended to the wounded, Theresa and other runners were turned away from the chaotic scene. Husband and wife both discuss their experiences.